What’s a Geek caught up with (well, more like ambushed) Arnold Arre during the October Komiket at Centris and had a chat about his highly anticipated graphic novel, what he’d been up to during his hiatus from comics, as well as big upcoming projects – including a film for one of his best-known works. What’s a Geek: Was a movie the first thing you had in mind, when you were approached to develop The Mythology Class for another medium? Not really. When I did Mythology Class, it was in 1997. I guess it’s the way I make comics, because I’m influenced by film. A lot of fans, after they read the book, they tell me it feels like a movie. And maybe because I infused a cinematic touch into it; it’s my style, I love movies. It’s natural that people would say the next step would be, “Why not make it a movie?” It wasn’t meant to be one. When I was making Mythology Class, I was just thinking of telling the story, nothing else. WAG: Have talks for the movie been just a recent thing? Or have they been going on for a while? WAG: Did Jerrold [Tarog] approach you? Yes, it was Jerrold who approached me. It was after Jerrold pitched the story to Artikulo Uno when they read the book, liked it, and called him for a meeting. WAG: Are you working closely with Jerrold on the script? I can’t say. It’s still under development. WAG: Zipped lips! Moving on then… There was a long hiatus between Martial Law Babies and Halina Filipina. WAG: Was Halina something you planned over that time? You did animation work as well. What made you want to go back to the comic book format? Halina Filipina was actually finished in 2002. It was supposed to be my 3rd book. When I finished it, I was fresh out of After Eden. And I said, we can’t follow up my 2nd book with another relationship story. Back then, in 2002, I was very much into creating Filipino superheroes. Andong Agimat became my 3rd book, and I shelved Halina. WAG: Is [Halina] the same story it is right now? Or did you change it? WAG: Which came out in Martial Law Babies, which is heavy on social issues. Exactly. Which is the reason I released Martial Law Babies, because I had ideas and I really thought I was never going to release Halina. I might as well get those ideas out, so Martial Law Babies was born. 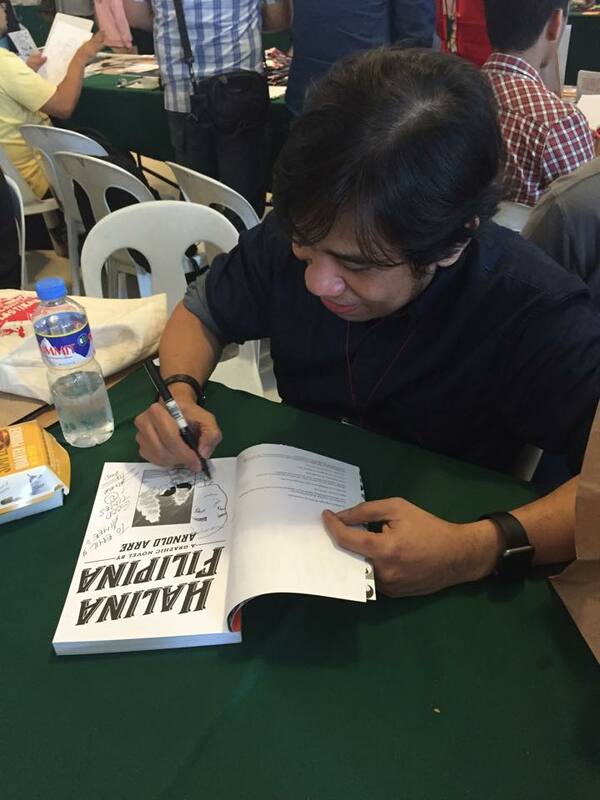 Reading [Halina] after 13 years… it just felt like it lacked flavor, unlike Martial Law Babies. But now I changed everything, and like I said, I’m a different artist now. I see things differently now, I have ideas about things I didn’t have before. I like this new version of Halina. WAG: Halina is a story about an expat who experiences Filipino culture firsthand. Where did you draw inspiration for that storyline? In 2002, I finally got to meet some cousins who were living in the States. It’s funny, because there are some things that we, like for me, hate about the country. Maybe back then I was going through some things. But for them, having lived in the States, they love it. I hated traffic, for them, “Oh this is exciting, we’re riding a bus, a jeepney.” And then I began to ask questions: Who’s more patriotic? People living here, or people living there? Most of my cousins, they really love everything that’s pinoy, even though they’re living (in the U.S.). Is it external? If you’re thousands of miles away from your home country, is that when you miss it and become patriotic? Those were the questions that kept bugging me, and I thought, I might as well write something about it. What if this half-Filipina, half-American came home to meet her parents, and what would happen if they meet another person who’s sick and tired of this place? He’s a struggling writer, he hasn’t had a break… jaded na siya, and he’s pretty much aware that it’s a Third World Country and he’s having Third World blues. I really wanted it to be a touching, sweet story. I didn’t want it to be a romantic-comedy, because if I told you the plot, the first thing that comes to mind is comedy. WAG: Did you mean it to be a love story? I did. I guess that’s just me. I wrote this after After Eden, I was in that phase… Now that I’ve grown up now, I’m wiser. There are so many elements that we needed to talk about. What are these factors that affect the relationship? One growing up in the States, one living here. One living in a First World country, another in a Third World. What are those factors, the tensions, the conflicts? WAG: Between publishing Halina and your last work, how have you changed as an artist? I’m learning how to control my page count. I would tell my publisher, “Jamie (Bautista), promise, 100 pages lang ito.” Then I would give him 250 pages. Which is what happened to Halina. WAG: We don’t think anyone’s complaining! I know! But I have tendency to meander on certain plot points. And I think I know how to streamline my stories now. There are time as an artist, when you have a following, fans, you want to feed them… give them fan service. But no, you can’t, you have to focus on the story. Even though they want that scene to happen, in my head it doesn’t work for the story, so might as well cut it. But it’s nice that fans support me and love my work! From here, do you have any upcoming projects that we can look forward to, in comes and other media? Hmm, maybe not. I don’t know. But I’m writing a new mythology story, completely different from Mythology Class. This is High Fantasy. WAG: But are you still drawing from Filipino folklore and culture? Yes, always. One thing I learned, every time we go to Japan… they love their own. They may be influenced, but the moment they’re influenced, they absorb it, they build on it. They support their own. I want that, I want that to happen here (in the Philippines). So most of my stories are based on us. As much as possible, not 100%, I try to draw everything that is us, or at least that image of our culture. Because that’s what we have and what we can share. WAG: What do you think is it about Philippine mythology that makes a big selling point? Especially with the popularity of Trese and other local komiks, and TV shows based on mythology. What is it about that that inspires you? It’s personal. As a kid, I remember going to the library and reading all those bedtime stories in European folklore… and in one corner there was a book about Filipino mythology. It was the only book on that in the library and I opened it. And I was hooked. I didn’t know we had creatures like this. I’m old, so this was way back in 1978; I think I was 6 years old. My parents would bring be to Quad, now Glorietta, and there used to be bronze statues. One of them was called “Tame the Tikbalang.” It’s this guy taming a giant tikbalang. That really stuck. It’s more personal than anything else. Since then, I’ve been keeping that. We have this rich culture. We have so many stories to tell. Yet we’re not telling them because we’re being influenced by some other culture like Western culture. That’s the best way to be original, since no one’s doing it… you’re guaranteed to be original. WAG: Is there a particular character in Philippine mythology that you’re drawn to? There’s so many! Tales of Lam-Ang, and (Rajah) Sulayman. Warrior stories and legends… it’s the whole world that I’m drawn to. WAG: Finally, What’s a Geek? A geek is cool. I’m a geek, we’re all geeks. There are geeks with cooking, geeks with cars, and I’m a geek with comic books. So it’s cool. *Some answers were edited to reflect the true intention of Arnold Arre. We apologize for the confusion! Preppy riot girl with a geek streak. Tweet me: @gdensing. ← All-New Wolverine #1 Review: SNIKT!